Signs, or signage, for buildings used to store chemicals, are designed to provide safety for personnel and for the public. There are a number of different signs used to alert people what type of chemical is being stored and the proper precautions necessary to take when working in these areas. 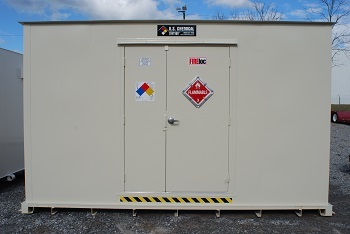 In the article below we will cover signs that you will see on chemical storage buildings and larger sized lockers. NFPA 704 diamond, is the most common chemical storage sign. It displays chemical storage codes in an easy-to-read format. NFPA illustrates chemicals in groups to easily alert people what type of chemical is being stored. Chemical groups should be stored separately from one another. The groups are: Metals, Acids, Bases, Oxidizers, Flammables, Poisons, Explosives, Reactives, Cyanides and Sulfides, and Low Hazards. Note: According to chemical storage codes, Ammonium Nitrate is considered an oxidizer, but should be stored separately from all other chemicals. 0 Will not burn under typical fire conditions. 1 Does not burn readily; requires extensive preheating before ignition and combustion can occur. 2 Must be moderately heated or exposed to high temperatures before ignition occurs. May release hazardous vapors when exposed to flame. 3 Liquids and solids that can be ignited under almost all ambient temperature conditions. 4 Burns readily, at atmospheric pressure and normal temperatures. Vaporizes at atmospheric pressure; vapors may be toxic. Includes cryogenic material, and any liquid or gaseous material which is a liquid under pressure and has a flash point below 73°F and a boiling point below 100° (Class IA) including Ethyl Ether and Pentane. 1 May cause significant irritation. 2 Exposure may cause temporary incapacitation. 3 May cause serious or permanent injury, even with short exposure. 4 Short exposure may cause death or major injury. 0 Normally stable, even under fire conditions. Not water-reactive. 1 Normally stable; can become unstable under pressure and high temperatures. 2 Reacts violently with water. High temperatures result in violent chemical change. 3 May explode but requires a strong initiating source. Must be heated under confinement before initiation. Reacts explosively with water. 4 Readily capable of detonation or explosive decomposition at normal temperatures and pressures. OX Oxidizer – contributes to the combustion of another material. W Reacts violently or explosively with water. FM and OSHA approved stickers are other types of signs that are present on chemical storage buildings. These types of signs show which building is FM and OSHA Approved. Manufacturers will sometimes place warning signs on all four sides of the building if the chemical storage building is in the open where workers can easily see what type of chemical contents is being stored inside. Contact US Chemical Storage for more information regarding safe chemical storage practices and for a free consultation on your chemical storage needs.